As you know that we (who live in abroad) eat ruhi fish a lot and a fish always comes with a head. I am just bored to have muri ghonto. So I make Rui-er muro aloo motorsuti / Ruhi head with potato and peas. 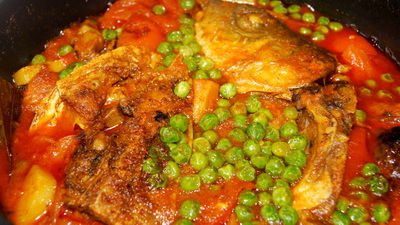 You can use even ruhi fish or any other fishes for this recipe. Here I used 1 fish head cut into pieces and lots of chilli powder. Use less chilli powder if you are cooking fish pieces. 1. Clean the head pieces and pat dry it. Add turmeric and salt. 2. Heat the pan with oil and fry the head pieces about 4-5 minutes. Remove head pieces from hot. 3. In the same pan add onion sliced and fry it till it becomes soft. 4. Add rest of spices(except cumin powder), salt and bay leaf and cook it till oil is separated. 5. Add potato and stir it 1-2 minutes. Add 3 cups of water. 6. When gravy comes into boiling point add fish pieces. 7. Cook it under closed lid about 8 minutes and add tomato. 8. Cook it 2 minutes under closed lid and add peas. 9. After 2 minutes add roasted cumin powder and remove from heat. 10. Serve Rui-er muro aloo motorsuti / Ruhi head with potato and peas with plain rice. My name is Hani, i am from Indonesia but my husband is from bangladesh and we live in brisbane. I want to thank you’ve really helped me to learn to cook dishes from bangladesh.